I was the 2010 and 2011 Program Coordinator at the Muny, “America’s Oldest and Largest Outdoor Theatre”. The Muny puts on seven major shows in roughly eight weeks, and everything moves like lightning behind the scenes, including all design and marketing. Putting together the program was an incredible race against time — information would change up to the very last minute of every print deadline and there were hundreds of important details. Creating a program that was accessible and appealing to thousands of diverse audience members (the theatre seats eleven thousand and was usually packed) also presented unique challenges. I laid out and balanced all information within the program itself, from cast to plot summaries to donor lists to ad spots. During my tenure as Program Coordinator, I redesigned the program to be cleaner and more accessible, moving from ink-heavy old-fashioned graphics to more legible typefaces that had also lighter environmental impact. I also increased the designed elements within the program, tying certain internal hierarchies together with specific graphic treatments and making in-house ads more consistently presented. 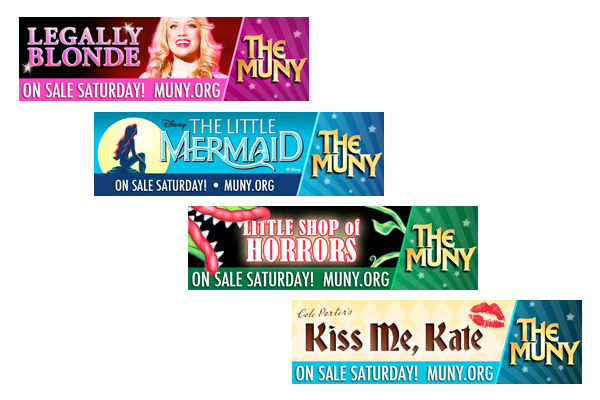 In addition to the program, I also designed ads, created graphics for online use and designed the Muny’s billboards (shown). Speeding down the highway and seeing your own work looming on the horizon is quite an exciting experience!